Nigeria's Vice President, Yemi Osinbajo, has disagreed publicly with his principal, President Muhammadu Buhari on state police. Vice President Yemi Osinbajo has openly disagreed with President Muhammadu Buhari on the need to cede police establishment powers to state governments. Mr Osinbajo said he had been a longstanding proponent of state police and, in fact, found the current federally-structured police system largely ineffective. By this disclosure, Mr Osinbajo has distanced himself from Mr Buhari, who has long rejected the state police and other components of restructuring. The president believes there are no sound economic bases on which establishment of state police could be affixed, saying most Nigerian states are not financially upright to sustain internal police system. “How many states are able to pay their workers in time? And you add the police to them? People should look at this matter very well. “You cannot just give someone guns and ammunition, train him and refuse to pay him, you know what will eventually happen,” Mr Buhari told the Voice of America in early May. Mr Osinbajo has been sparring with Mr Abubakar, who is now seeking the presidential ticket of opposition Peoples Democratic Party to unseat Mr Osinbajo and Mr Buhari in 2019, over the perennial conversation around Nigeria’s current sovereign structure, which some have criticised as unfair, exploitative and unworkable. Their arguments, which come as political activities for 2019 general election heat up, highlight the topical influence the restructuring agenda may have on the campaign trail. Like most other functions of the federation, Nigeria’s Constitution accords exclusive control of the police to the central government. The need to dismantle this controversial arrangement is amongst the key fabrics of restructuring, and often at the heart of the debate, alongside resource control. But while calls for restructuring have grown in recent years, debates over the essence of the cause have seen citizens draw divergent conclusions, and proponents are often dismissed as demonstrating dishonesty, shallowness or outright confusion. But Mr Abubakar, perhaps the most visible campaigner for a restructured Nigeria today, insists he has clearly defined what constitutes restructuring, accusing his detractors of deliberately muddling up his position for political gains. Replacing state of origin with state of residence, and Passing the PIGD so that our oil and gas sector will run as a business with minimal governmental interference. Mr Osinbajo sparked the debate when he addressed a gathering in the United States last week, during which he commented on restructuring Nigeria. The “problem with our country is not a matter of restructuring…and we must not allow ourselves to be drawn into the argument that our problems stem from some geographic re-structuring,” the vice president said. But in his rebuttal, which the vice president’s office sent to PREMIUM TIMES Tuesday, Mr Osinbajo touted himself as a longstanding advocate of restructuring, buttressing his claim with a slew of comments and actions he had been involved in in the past. “That would only result in greater administrative costs. But there can be no doubt that we need deeper fiscal federalism and good governance,” he added. For the decades that debates around restructuring Nigeria have featured at the top of national concerns, including national conferences held to harmonise some of its components, calls for the actualisation have come predominantly from the south. While critics of Mr Buhari said his reluctance to embrace the cause was because it could be politically-toxic for his re-election ambition, Mr Abubakar’s opponents are skeptical about his absolute commitment to the cause, especially as it remains hugely unpopular in his northern region. 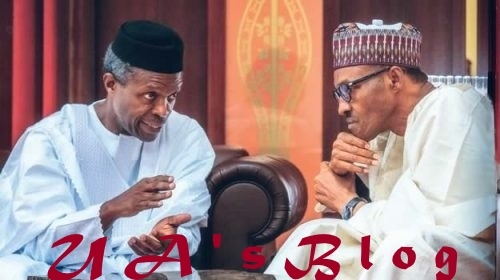 Still, the divergent views of Mr Osinbajo and Mr Buhari on restructuring underscore their deep disparity in their belief systems, said political analyst Shola Olubanjo. The analyst saw the raging arguments between Mr Osinbajo and Mr Abubakar as a plus for the 2019 elections, still. “It is a breakaway from the flimsy discussions that we have been seeing for too long, but I would appeal to that all parties to be sincere in their agenda for Nigerians,” he said.